The dinner party went well. There was succulent ham cooked in cider, creamed sweetcorn and garlic baked carrots, potatoes roasted in goose fat and leek sauce. Followed by my first attempt at my mum’s famous trifle. There were third helpings of everything! 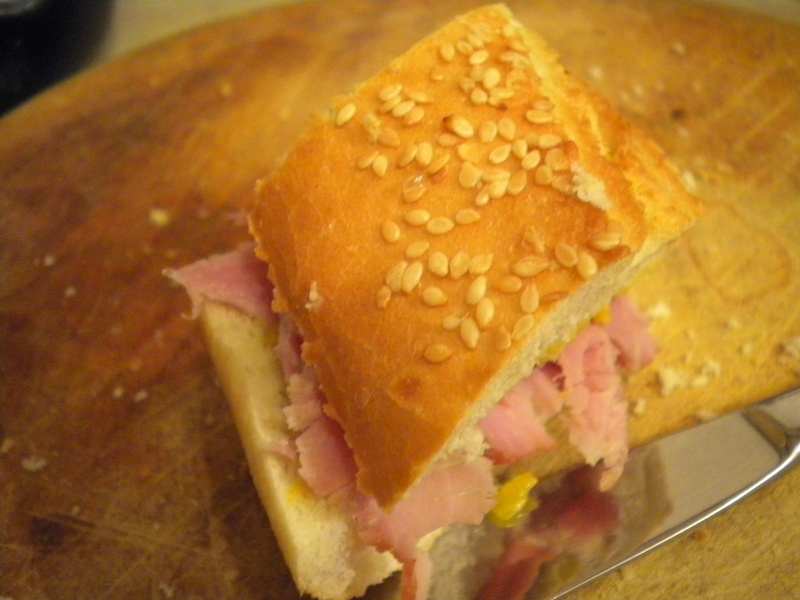 Ham Cooked in Cider is a Nigella recipe which I didn’t read too closely; I liked the idea of it, got the gist, and adapted (bastardised) it to my needs. Cover a 3.5lb gammon joint in water and bring to the boil; throw out the water and cover it in 2L cheap dry cider. Add water if it doesn’t submerse it and bring it back up to the boil. Turn down the heat to achieve a fast simmer and add a few bayleaves, a peeled onion pressed with cloves and a few stalks of celery. The cloves influence the whole dish with a warm appley note; the onion, herbs and celery are classic stock ingredients (in both senses of the phrase). Alas, no photo. By the time I remembered, we’d eaten most of it. I admit, the hedonist has a thin Puritan streak running through her. She can’t throw anything out without a heartrending tug. If she can use it, it stays. Dang it, even if she knows she doesn’t want to eat it, it’ll stay in the fridge until it’s far beyond best before. Some leftovers are completely pleasurable though. What to do with pastry leftovers is nearly a reason in itself to make pastry. My mum used to make a little jam or currant tart, or marmite straws. Me, however. I am far less austere in attitude towards the little luxury by-products of baking. *Roll out pastry till it’s as thin as you can get it without it breaking up. Repeat *-* until you have as many layers as you can be bothered to make. Grate one last heavy covering of cheddar over half the shape, fold in half and press down with the rolling pin. Nip the edges in case you’ve put a lot of cheese in there. No point in it escaping. Brush with milk if you remember, it’s not essential but is a nice touch. Semi-cut the product into strips and bake in a preheated 200 deg C oven for about 15-20 minutes. Tip: Try not to handle the dough too much, just use the rolling pin to push it about as much as possible. On a cool surface is best. 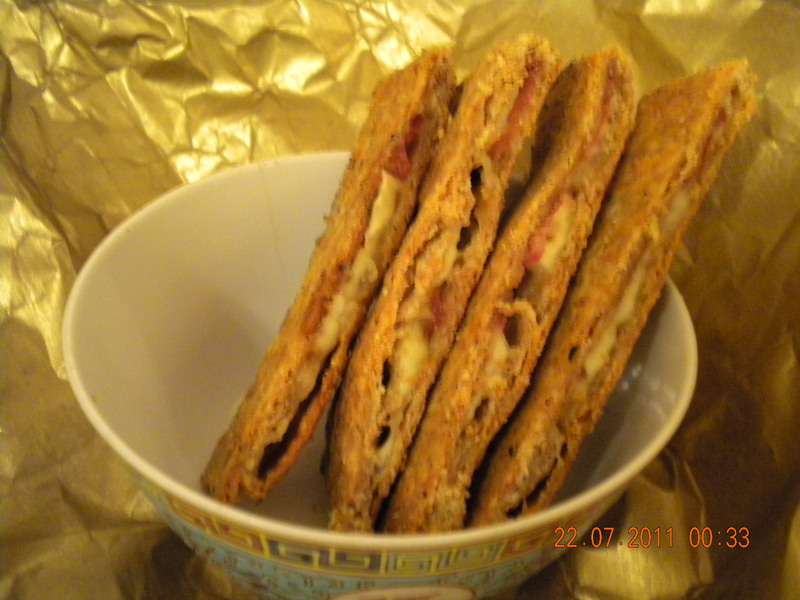 Thin slices of Brie and a single layer of Serrano or Proscuitto ham. A long squeeze of Marmite across the cheese before folding. Fried onions mixed into the grated cheese at the end. Raspberry jam and cheese, or sweet chutney and cheese.